Knowing the names of different parts of braces can be helpful during orthodontic treatment. 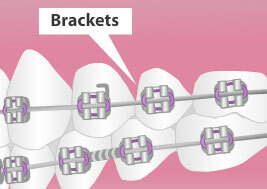 Following is a list of orthodontic terms associated with braces. Orthodontic bands are rings that fit around the back teeth, or molars. Orthodontists select the size of band and use dental instruments to ensure a custom fit. 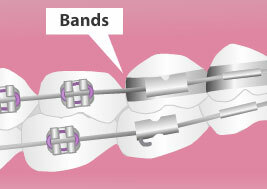 Bands typically have welded metal attachments that allow arch wires to pass through them. Traditional bands are made using stainless steel, but ceramic braces are becoming more popular as they are available in a variety of transparency levels that are less conspicuous than metal. Bands are cemented to the teeth with specific dental cement. The most common type of braces use brackets, small, square-shaped pieces, which are attached to an orthodontic band or chemically affixed to the tooth surface. Brackets are available in different compositions, including metal, and ceramic. Each bracket has a slot that will hold and support the arch wire. Some brackets have hooks which are used for attaching rubber bands. 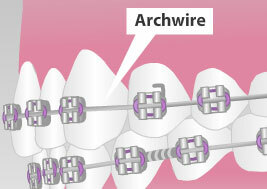 Arch wires are made of metal and formed explicitly to fit into the brackets around the mouth. Arch wire adjustments exert pressure on the teeth, and are responsible for the ongoing repositioning of teeth toward proper alignment. The wire is exchanged often during the treatment process, to heavier wire that can exert greater movement. 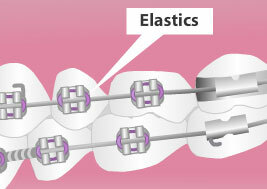 Rubber bands, or elastics, are removable. They are attached to the bracket hooks and connect the upper and lower teeth. The pull of the elastic applies consistent pressure which gradually influences upper and lower teeth movement toward the correct bite. Ligatures are the tiny elastic bands, or wire, that attach the arch wire to the brackets. These ties can be clear, or silver, and also come in a multitude of colors. Ligatures are replaced whenever there is an orthodontic adjustment to the braces. 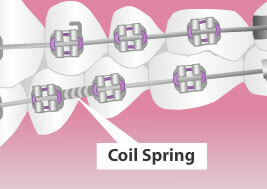 Coil springs are sometimes placed between two teeth brackets when the teeth are too closely together. The spiral is positioned over the arch wire, and exerts pressure for teeth adjustment that will separate the teeth and open up space. Power chains are elastic or wire rings, linked together, to form a continuous band between teeth. They are used primarily to help narrow spaces or prevent spaces from opening between teeth. Like elastic ligatures, they are replaced during every adjustment.